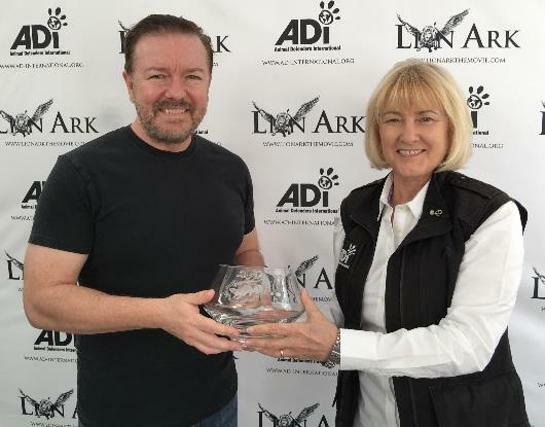 Animal Defenders International (ADI) has presented multi-talented comedian Ricky Gervais with the prestigious Lord Houghton Award for his high-profile advocacy on animal protection issues, creating awareness in a unique way to worldwide audiences. Ricky is currently on tour with his ‘Humanity’ show, and has been a supporter of ADI for many years, being one of the first to champion their ‘Stop Circus Suffering’ campaign. While at XFM in the late 1990s, Ricky spoke out against the horrific abuse of elephants, a baby chimpanzee and others documented by ADI at animal trainer Mary Chipperfield Promotions, which resulted in cruelty convictions for the owners and their elephant keeper. Ricky has continued to be an outspoken advocate for the campaign, urging governments in both the UK and US to introduce legislation to prohibit travelling wild animal acts. The shocking violence inflicted on Anne the elephant at Bobby Roberts Super Circus in 2011 and exposed by ADI “graphically displays why the government should ban wild animals in circuses” Ricky said, continuing “I am appalled that wild animals are still kept in circuses and fully support the call for a ban. It is high time that government got on and implemented one.” ADI’s evidence led to a government commitment to ban and a cruelty conviction for Anne’s owner – yet five years later, the government’s bill has still not been presented to Parliament. The comedian, writer and producer, who has over 12 million twitter followers is an outspoken advocate on several animal issues including trophy hunting, blood sports and animal experiments. Last year, supporting proposals to uplist the African lion to Appendix I (greatest protection) at the CITES conference in Johannesburg, Ricky said “The survival of the African lion hangs in the balance. We must stop blood-thirsty hunters from decimating our wildlife for a barbaric adrenaline rush or trophy piece to show off to their mates.” Sadly, fierce opposition from lion bone/body part traders fought off lion protection this time, but the campaign continues. The Lord Houghton Award was initiated in 1980 as a lasting recognition of the significant contribution made by Lord Houghton to the animal welfare movement. During his long parliamentary career, he was a passionate animal welfare advocate, actively campaigning for changes in legislation to bring about improvements in animal welfare, even into his nineties. Each year one of the four participating organizations – Animal Defenders International, OneKind, Cruelty Free International and League Against Cruel Sports – selects the recipient of the award. In 2012 ADI presented the award to legendary multi-Emmy award winning TV host Bob Barker – an ardent public advocate for animals who, among other achievements, had ended each episode of his iconic show ‘The Price is Right’ with a plea to his audience to spay and neuter their pets. This presentation of the 2016 Lord Houghton Award to Ricky was delayed for the completion of a record-breaking 18-month rescue mission in South America. ADI rescued over 100 wild animals from circuses and the illegal wildlife trade in a mission to assist the governments of Peru and Colombia with enforcement of their new laws ending the use of wild animals in circuses. Native wildlife such as bears, monkeys, birds and others were rehomed in Amazon sanctuaries, a tiger to a sanctuary in Florida and 33 Africa lions were rehomed to their native Africa.